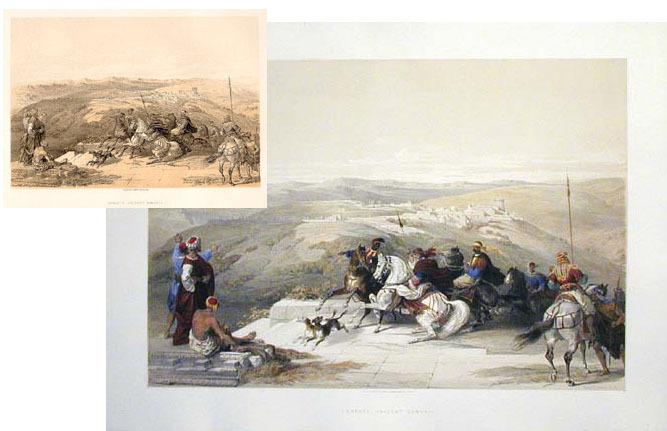 The lithographs as published by F.G. Moon caused an immediate sensation, and the press and critics raved. There was great public demand to view and purchase the prints, but they were expensive - the entire set sold for around $2,000 in today's currency. The result, not surprisingly, was the appearance of cheaper pirated reproductions almost immediately. There were various means of producing such pirated editions, from early versions of photo-mechanical or optical reproduction to simply hand copying the images onto new, smaller lithographic stones. None, however, were of the size and quality of the first editions, as it was simply too expensive and time consuming to duplicate them. To counter such piracy, F.G. Moon and Roberts authorized smaller and less expensive versions of the prints, beginning with a work produced in Belgium known as the "Stroobint Edition", after the lithographer who drew some of its plates. The Stroobint prints, whose publication began in 1843 while the Moon editions were still in the early part of their own press run, come the closest to the first editions in size and quality, though in this case "closest" is a relative term. They are about 75% of the size of the originals, but the lithography is greatly inferior, and hence their value is much less.